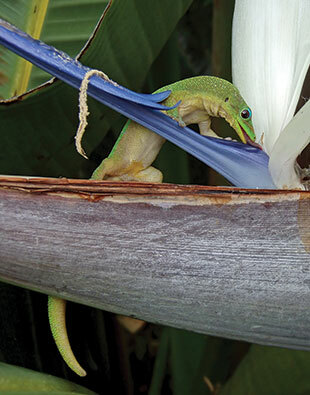 LAPPING LIZARD: A gold-dust day gecko (Phelsuma laticauda) licks nectar from a bird-of-paradise flower on the island of Hawaii. 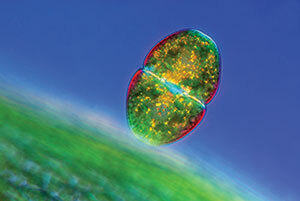 Posted: October 9, 2014WIKIMEDIA/BROCKEN INAGLORY ETHEREAL ALGA: In the unicellular freshwater alga Cosmarium (magnified 100x), an isthmus containing a single haploid nucleus separates two symmetrical semicells. 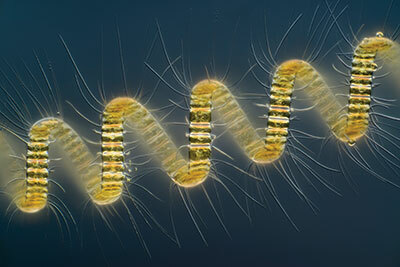 GOLDEN SPIRAL: Cells of the marine diatom Chaetoceros debilis (magnified 250x) form a corkscrew-like chain.